One of the youngest in the "30 Americans" exhibit, which opens Oct. 1 at Washington, D.C.'s Corcoran Gallery of Art and features the work of 31 black contemporary artists, Nina Chanel Abney, graduated from Parsons School of Design in 2007. It wasn't too long ago, she tells The Root, that she was studying the work of her fellow "30 Americans" artists. As the Corcoran geared up for the show's opening, Abney chatted with us about her work, the exhibit and her influences. The Root: What's the one piece for you that best represents you as an artist, and why? Nina Chanel Abney: Probably the piece I'm working on currently that no one's seen. I'm currently working on a 60-foot-long painting that's composed of dying different panels. Loosely based on, like, the end of the world. So I think that represents me best now 'cause it's a culmination of everything that I usually put in my work. All elements of my different styles. My earlier work is more loose. And some of my more recent work is tighter, more abstract. TR: Why is an exhibit like "30 Americans" important in the art world? NCA: A lot of the time, people have this perception of what a black artist is. And [this exhibit] kind of throws that out the window. Because the show is work of all different types — not necessarily a stereotype of what a black painting or a painting of black issues would be. These artists touch on all types of different things. TR: How do you incorporate your own racial identity into your work? NCA: I don't necessarily concentrate on it. I think it's inherent in the work because I'm African American. Most of my work is based off my everyday personal experiences and things that happen in the news. TR: Are there any artists in the show who have directly influenced you or inspired you? NCA: I enjoy all the artists, but Robert Colescott is someone I turned to for visual inspiration. And I can find something in everyone's work that is inspiring to me. 2007 — I just graduated [from art school in 2007]. So not too long ago, I was looking up these artists in books. And now I'm showing with them. I think I'm a fan, too. 4 Questions With Artist John Bankston. '30 Americans' Exhibit Sneak Peek: Photos. 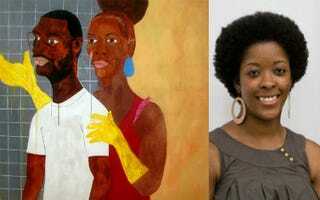 '30 Americans' and the Meaning of Black Art. 4 Questions With Artist Hank Willis Thomas.